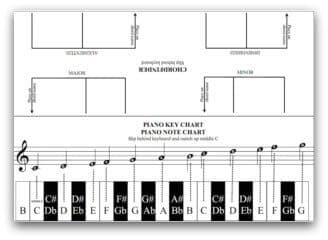 This printable Piano Key Notes and Chord Finder is a handy little DIY tool for beginning pianists! Just print it, fold it and place it behind the piano keys on your piano keyboard, matching it where indicated with "middle-C". 1. You can easily see the layout of the keyboard and the piano key names on one side. Stick the paper behind the keys on the piano, find middle-c and line it up. Now you have all the names of the notes and keys right in front of you! 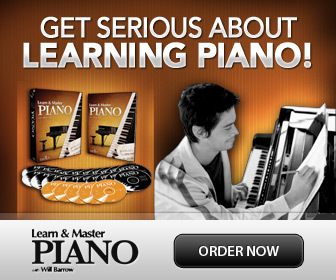 Great for when you are just starting to learn piano. 2. On the other side you can see how you can play four basic chords, also called triads, in root position. The markings are matched to regular sized keys to help you find the major chord, minor chord, diminished chord and augmented chord. Simply match the first line with the middle of any key you want your chord from, and two more notes to complete the chord will line up. Presto! An instant chord finder. You can also print on thicker paper, cut in half and use the two sides separately. Tip: As you start to learn the piano, another clever tool is to put Keyboard Stickers on the keys with the note names on. These can be easily removed later! Stretch out your arms and pull your hands from both ends of the piano keyboard towards the middle. When they meet, there are two black keys. In between those is the note D, and the white key to the left of those is middle C! Easy! Use the note and chord finder tool (above) as you start learning the notes on the treble clef and how to read sheet music, and you will learn all the note names much easier. Of course, you might find that after using this key notes finder a couple of times, you will hardly need it anymore since you will learn these basic chord patterns by heart very, very quickly. But that’s OK I guess! I hope you'll find this little piano key note finder as useful as I have.